Camera footage has confirmed pine marten in Kielder Water & Forest Park for the first time since planting in 1926. This is great news for the partnership of organisations working together for pine marten conservation in northern England, including Forestry Commission England, Northumberland Wildlife Trust, Aberdeen University and Vincent Wildlife Trust. The cameras are in a remote area of Kielder Water & Forest Park as part of a red squirrel monitoring project and while many other species are frequently captured this is the first time pine marten have been spotted. 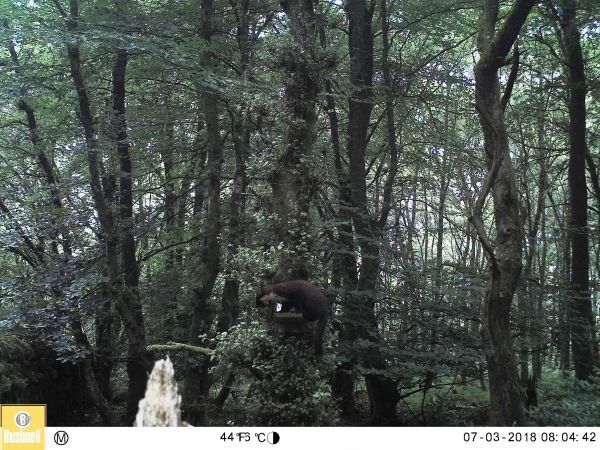 The images were first seen by John Hartshorne, who manages the fieldwork and ecology education organisation Albion Outdoors and has been helping with the squirrel surveys as part of the Red Squirrels United project for several years now. ”It is very common to see wildlife other than squirrels on the cameras I use. Badgers, foxes, deer and birds of all sorts are regular visitors. This July I have caught some excellent pictures of red squirrels but also an unexpected visitor – a pine marten, sitting on top of one of the squirrel feeders. This was most unexpected but I now have both still pictures and a short piece of video firmly placing pine marten in Kielder Water & Forest Park. Historically, pine martens were commonplace but habitat clearance and persecution has led to them being eliminated from nearly all of England". Pine martens are elusive members of the weasel family and their biggest UK stronghold is in Scotland. Ongoing studies in collaboration with the University of Aberdeen will provide evidence on how pine marten influence other species in Kielder Water & Forest Park, which have themselves previously colonised the maturing woodland. Recent research carried out by Aberdeen University found that in Scotland, areas where pine martens were increasing, red squirrels also increased, but grey squirrel numbers plummeted drastically. This could have huge implications for organisations involved with trying to conserve reds in the UK and across Europe. Being an important red squirrel reserve, partners at Kielder Water & Forest Park are very excited to welcome the pine marten into their woodlands.